Sebastian Junger is a prominent journalist who is best known for his 1997 book The Perfect Storm: A True Story of Men Against the Sea, a description of the "perfect storm" of October 1991 in the northwestern Atlantic Ocean. The fishing boat Andrea Gail, based in Gloucester, Massachusetts, and her six crewmen were lost off the coast of Nova Scotia in that storm. The book and subsequent movie made the term perfect storm part of the common lexicon. Perfect storm is now widely used to describe any situation where a rare combination of factors leads to a dramatic increase in the intensity of a situation. The term "perfect storm" appears in Thackeray's 1847 novel Vanity Fair, and the Oxford English Dictionary cites its use back to 1718, but it was Junger's book that really popularized the phrase. Junger is half-owner of the Half-King Pub in the Chelsea district of Manhattan, in New York. It's at 505 West 23rd Street, at 10th Avenue. I went to that pub and photographed the toilet. 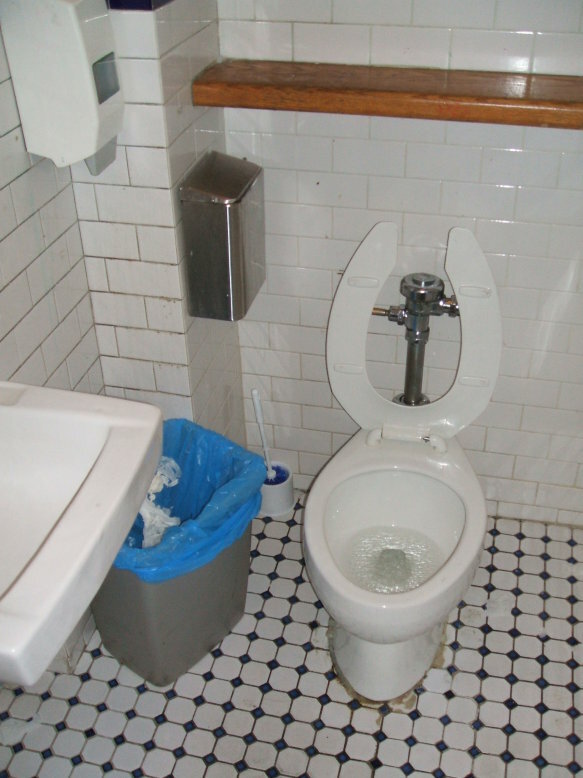 Ergo, Sebastian Junger's toilet. Or at least a toilet in which Sebastian Junger has 50% ownership. The storm now called the Halloween Nor'easter of 1991 was especially extreme because three uncommon phenomena happened to come together. A hurricane, the last tropical cyclone of the 1991 season, brought in a large amount of moisture from the tropics. A low-pressure system provided warm air from one direction. Those two met cool and dry air coming from a high-pressure front coming in from another direction. Waves up to ten meters high hit the Atlantic coastline, and a buoy off the coast of Nova Scotia recorded a wave 30.7 meters high. Sustained winds of 90 kph with gusts to 116 kph were recorded east of Cape Cod. Some $200 million in damage occurred over seven U.S. states. Damage was caused from Canada south to Florida, and it was greatest in Massachusetts. Junger has more recently made documentary films. His book War and 2010 film Restrepo are based on a year he and photographer Tim Hetherington spent with a platoon in the Korengal Valley in Afghanistan. The 2014 film Korengal then continues to follow those soldiers later in the Korengal Valley and after their return to the U.S. The Half King Pub is almost underneath the High Line Park, an abandoned elevated railway line that has been turned into a long, narrow, elevated park. The Chelsea District used to be an almost exclusively industrial district. The High Line railway was built in the 1930s to move freight trains overhead and free up the streets. 10th Avenue had come to be known as Death Avenue given the number of collisions between freight trains and street traffic. The High Line moved the tracks overhead. Switches led to elevated branch lines running directly into buildings. The last trains ran on the High Line in 1980. For close to thirty years it was simply abandoned, with plants and even trees growing out of the elevated structure. Work began in 2006 to convert the railway into a linear park. The first section opened in 2009, and the third and final section opened in September, 2014. The High Line Park is now about a mile and a half long. It runs between 10th and 12th Avenues, from Gansevoort Street in the Meatpacking District to West 34th Street. There are access points about every two blocks, at Gansevoort, 16th, 18th, 20th, 23rd, 26th, 28th, two on 30th Street, and one on 34th Street. 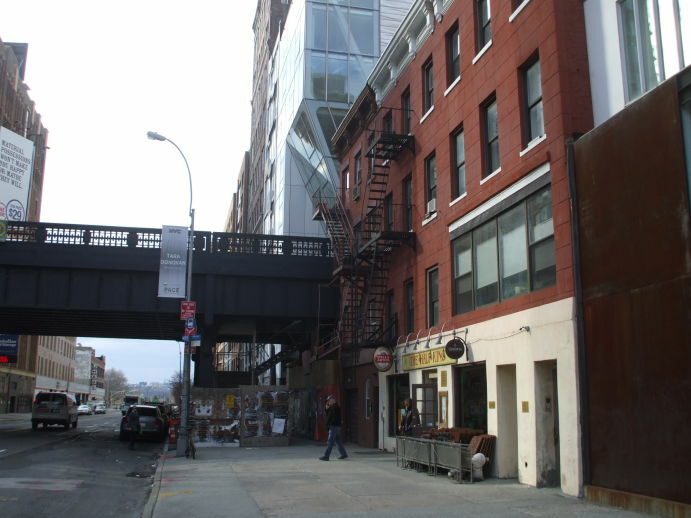 Wheelchair-accessible entrances with elevators are at Gansevoort, 14, 16, 23rd, and 30th Streets. Looking west on West 23rd Street from the corner with 10th Avenue. The Half King is at right, under the signs. The High Line runs overhead just beyond. As for getting to the Half King Pub, the nearest subway station is at 23rd and 8th Avenue. The M11 bus runs right past it as it travels north on 10th Avenue.